A Black Phantom (BP1) is a special form of some enemy that is stronger and more dangerous than normal. You can easily distinguish a Black Phantom by its appearance; a Soul like black body with a red aura. Even if it appears to be a human and perhaps even a friend you have met, Black Phantoms are always hostile and will single mindedly seek your death. Black Phantoms can also be another Online player who has invaded your world to kill you in Player vs Player combat! Under certain circumstances, some types of enemies and many NPCs have a Black Phantom form which appears. 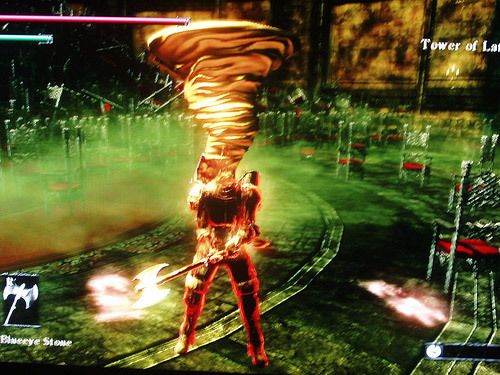 Creating the right conditions to encounter and defeat the NPCs in Black Phantom form is necessary to obtain certain unique items, and therefore earn several of the Trophies. Game controlled Black Phantoms have the same abilities, weaknesses, attack behavior and movements as the normal enemy type which they mirror. Compared to their non Black Phantom form, they will also have more HP and more powerful attacks. They are also more alert and will pursue more aggressively. There are different categories of Black Phantoms which you may encounter. They follow different rules determining when they appear and what the effect of killing them will be. When playing online in Body Form, your game may be invaded by another real player as a Black Phantom. Any location in a World, as long as you are Online and in Body Form. Once you clear an area of its boss Demon, you are safe from invasion from that Archstone backward. Each time you enter the world with Black or Pure Black World Tendency, these Black Phantoms appear in addition to the usual foe. Black Phantom forms of NPCs which you may encounter in Body Form at other times. If World Tendency is Pure Black. They will not reappear after being killed. Strongly shifts both Character and World Tendency towards White, but only if directly killed by the player. Other damage (poison, falling etc) do not count towards changing Character Tendency. The death of the phantom unavoidably changes World Tendency. These are NPC Black Phantoms that you will always encounter in a specific location in each World. Always appear in each playthrough. They will not reappear after being killed. Some normal enemy Black Phantoms reappear every time you enter/load the World. Each time you enter the World. Not dependant on World Tendency. When World Tendency is Pure White. As part of a quest from his sister Selen Vinland. Drops the Crest Of Vinland and his weapon, the Bramd. The Old Monk Archdemon of the Tower of Latria will summon a Black Phantom to fight on his behalf. As you ascend the tower in 3-3, the Old Monk will attempt to summon another player. When Online, any players that currently have a Blue, Black or Red Eye Stone placed anywhere in Latria may be summoned. That is providing they are in your Soul Level Range. That player will be the Black Phantom boss for this session. They will have the boss's HP and automatic Homing Soul Arrow Spell casting. If you are playing offline or there are no Online players available, then the default Claw wielding NPC Black Phantom will be provided by the game. This phantom will automatically cast Homing Soul Arrow at some point after taking damage. The strength of his Homing Soul Arrow will increase as his HP decreases. He may eventually cast a full strength, five orb Homing Soul Arrow when at low health, if given the chance. He may also on occasion cast Soul Arrow. 1. although both "Blue" and "Black" both start with "B", the abbreviation "BP" generally refers to a Black Phantom, since the context of a Blue Phantom in discussion is usually clear. The game itself refers to a Blue Phantom simply as a Phantom.